Levi Roots of Dragon's Den Reggae Reggae fame has put his name on a lot of foods since his initial investment. Most of these are spicy, not too spicy but certainly full of heat. When I spotted this Caribbean Crush drink I thought it may have been the perfect thirst quencher. On a very hot Saturday morning driving through town I needed something to cool down fast. This is probably too fizzy for that, but is still nice. It tastes a lot more fruity than Lilt and other mainstream brands. I liked it, but it's not special enough to actively hunt out like the Reggae Reggae Ketchup that I love so dearly is. These reviews always look a lot longer when I type them on my phone. To add to it the flavour is kinda Pineapple and Grapefruity, but not in a bad way. 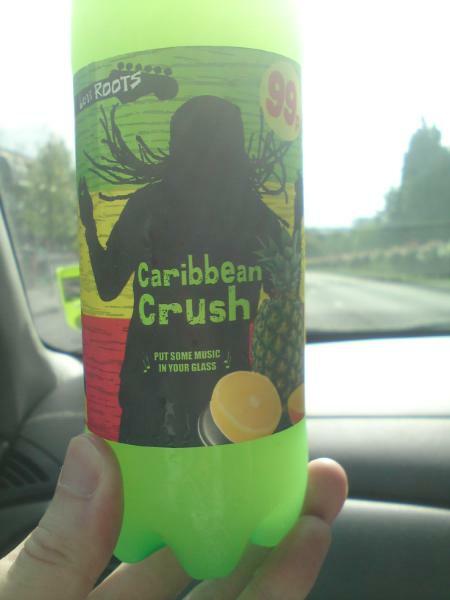 I seen this a while ago, never thought about trying it as it just looked like Lilt to me. It's nice that soda brands are trying to go for different flavours. Usually, when you see a green hued bottle it means lemon-lime, but Pineapple and Grapefruit sound delicious!